SheerinO'kho. Love the name. The more I read about SheerinO'kho, the more it comes across to me as an intelligent skincare range. The French natural skincare brand oozes charm and intellectual elegance, if one can call it that. It has a relatively small collection of ten products (though one is a kit) and interestingly, six of them are face creams. Sheerin'Okho has been around since 2005 and I think the best and most succinct way to describe it would be this phrase borrowed from its own website: "Pioneering environment responsive skin care". With its products, SheerinO'kho aims to address the effects that the environment has on the skin. Think air pollution, long exposure to the sun, drastic temperature changes (going from outdoors to indoors and vice versa), air-conditioning, etc. Like it or not, these factors have a negative impact on our skin and SheerinO'kho products are meant to provide a response to whatever skin imbalances these environmental factors have caused. Note: SheerinO'kho very kindly sent me some products last year. As I don't take the task of writing skincare reviews lightly, I have chosen to start writing my SheerinO'kho reviews only now, after having used SheerinO'kho on my face for more than a year. 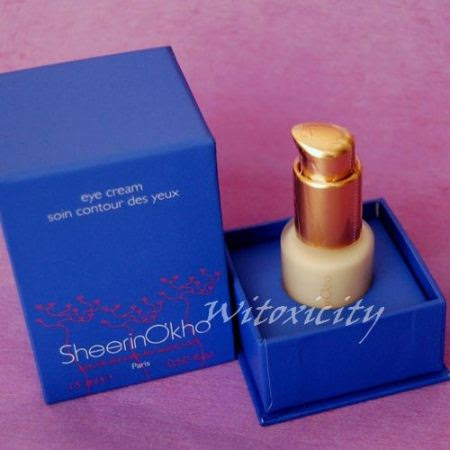 This review focuses on the SheerinO'kho Eye Cream. In time, I will do features on a few of their other products and write more about SheerinO'kho the brand. 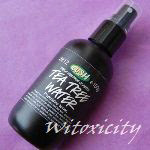 This skincare gives long-lasting vivacity to eyes tired by hyperactivity and downtown pollution. Active tripeptid ingredients, a product of bio-technology, work powerfully and instantaneously on wrinkles, smoothing the skin and restoring its elasticity. Marks of tiredness, pouches and shadows are attenuated by draining toxins and reinvigorating microcirculation. Developed from medical research and advanced formulation techniques. SheerinO'kho says it uses no paraben, PEG, colouring or artificial fragrance and its products are naturally scented with essential oils. SheerinO'kho uses recyclable packaging. The eye cream as well as its other face creams come presented in gorgeous boxes and chic glass bottles, each fitted with a lockable dispenser. This is indeed a quality dispenser. With it, it is easy to control just how much product you want each time, even if it's just a small drop. This drop that you see on my finger is just about what I need for both eyes. 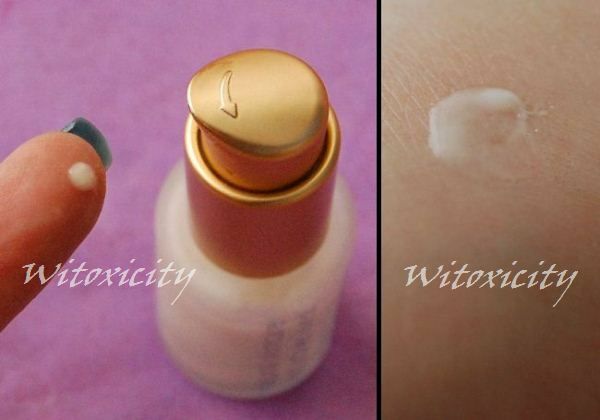 You really don't need much as the eye cream has a very light texture and it spreads easily. It is not sticky and it has a herbal, earthy scent. Any tightness felt on the outer corners of my eyes after facial cleansing quickly diminishes when I pat on the eye cream. Once absorbed, this gentle and non-irritating cream leaves the skin around the eyes a bit tacky, warm, nourished and ever so slightly plumped. I won't tell you that the fine lines that have been developing under my eyes have voila! disappeared. 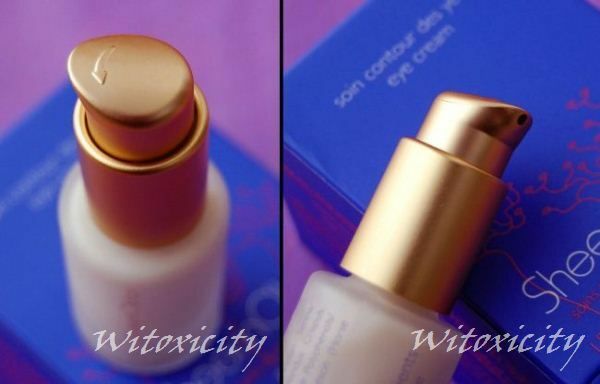 I am convinced though that the cream has helped, to a certain extent, to stave off the deterioration of the skin around my eyes. I am unable to comment on its ability to reduce puffiness and dark circles as I don't have major issues with these (I've been cursed with acne-scarred skin instead, thank you very much!). This has happened before: Once in a blue moon, I get a red, itchy patch on my eye lid close to my eyebrow. For the life of me, I don't know why it's always my right eye lid. This time around, I had so hoped that this eye cream would get rid of it but sadly, it didn't. Another thing I've noticed is that little flakes develop on my lid when I apply my eyeshadow primer over the eye cream (I use the Too Faced Shadow Insurance). Do note that after applying the eye cream, there is always a time gap of at least fifteen minutes before I use the primer. It seems to me that the flaky bits form when the primer gets in contact with whatever SheerinO'kho Eye Cream that is left on the skin. Anyway, there isn't a lot of the flaky bits, so it's easy to just wipe them away. A miracle eye cream it isn't but I will say it's a good eye cream. I'll tell you what I like even more: SheerinO'kho face creams. SheerinO'kho is a premium brand and its products are made in Provence, France. 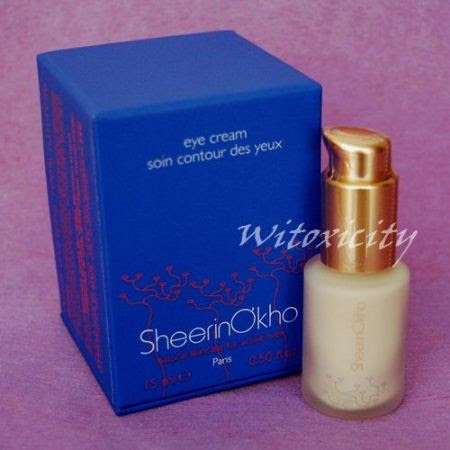 According to its website, the SheerinO'kho Eye Cream is priced at €49 for 15ml / 0.50 fl oz. SheerinO'kho recommends using it up within 6 months after opening but in reality, this little bottle lasted 10 to 11 months (used twice a day). I just made sure to always keep it in a cool, dark place. The brand offers international shipping directly from its website. The shipping rates are reasonable, from what I've checked, capped at €10. In the Netherlands, SheerinO'kho products can also be purchased in Amsterdam from C. Cosmetics & Care (prices vary), where I came across SheerinO'kho for the first time back in 2010. There, you can also view its short list of authorised SheerinO'kho retailers worldwide.